CHEEKTOWAGA, N.Y. — Buffalo Bills legend, Andre Reed, will hold his first post-Hall of Fame vote autograph signing event from 6 to 9 p.m. on Friday, March 21, at Bases Loaded Sports Collectibles, at 794 French Road in Cheektowaga, N.Y.. Individuals can drop off their memorabilia in advance if they are unable to make the event. Photo shows All-Time Buffalo Bills Great, Andre Reed, speaking in a Feb. 20, 2012 interview that was held at the Chautauqua Sports Hall of Fame Induction Dinner. Reed, recently voted into the Pro Football Hall of Fame as part of the Class of 2014, will enter the Pro Football Hall of Fame along with Michael Strahan, Derrick Brooks, Walter Jones, Aeneas Williams, Ray Guy and Claude Humphrey. The enshrinement ceremony will take place on Saturday, Aug. 2, 2014. Reed played wide receiver for 16 seasons, 15 with the Buffalo Bills from 1985 to 1999 and one with the Washington Redskins in 2000. During his NFL career, Reed was known as a highly durable, fearless over-the-middle receiver who was never afraid to take punishing blows in exchange for receptions, often shaking off tackles for significant after-catch running yards. Reed ranks near the top in most NFL receiving records and is widely considered one of the top wide receivers to ever play the game. Sports Speakers 360 is a booking agent for motivational sports speakers. 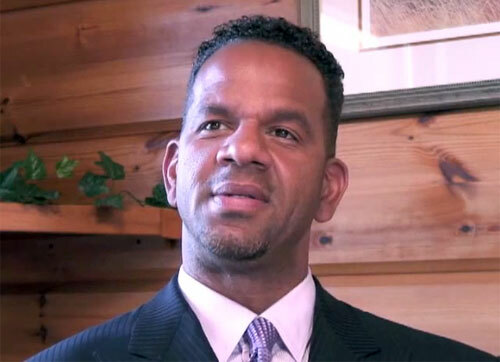 If you would like to book athletes like Andre Reed for an event, contact Andre Reed’s booking agent for appearance & speaker fees. For booking agent and appearance fee information on how to hire Buffalo Bills players for appearances, call 1.855.303.5450.